This peaceful early autumn landscape has been painted by talented Pavel Sladkov. It shows us the edge of the forest. 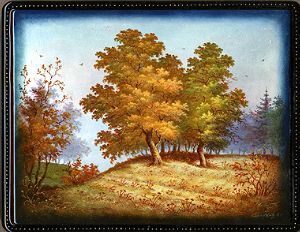 On the front scene we can see two or three large Oak trees ready to fall their leaves. The trees and bushes covered with yellow and orange leaves looks so beautiful! To reproduce realistically a chosen season the artist has used orange and yellow oils, partly greens. Looks like the artist picked up early morning time, so we can see a fog coming up from a ravine in perspective of the composition. The scene is framed with gold beads as well as the sides are decorated with them too. The box is constructed from paper-mache. Black lacquer is used to paint the exterior of the box while red lacquer completes the interior of the work. The lid is hinged to the top of the scene, and the box rests on a four legs. The work is signed with the artist's name in the corner of composition.